Have you ever had a really bad sunburn? You do not forget your worst burn. Mine occurred during a vacation to Kauai, Hawaii when I was 14-years-old. I spent several hours one day hanging out with a late 20-something-year-old family friend and her boyfriend. We swam, snorkeled, and drove around the breathtaking island in a convertible, getting my first taste of reggae. Particularly because the sky was gray and overcast, I didn’t even think about sunscreen (quite honestly, I don’t even think sunscreen was on my packing list for the trip). And I paid dearly…and painfully. I sat on the driver’s side in the back seat, with the top down. When snorkeling, the sun reflecting off the water onto my shoulders was especially harsh (a double whammy – the direct UV and its reflection). The cumulative effect? A deep second degree sunburn on my left shoulder, gift-wrapped with huge wet blisters and beefy red and raw skin. The worst part of it, though, was the almost nightmarish next 24 hours, when sunstroke and intermittent vomiting and severe dehydration took hold. Since that burn, I regularly check my left shoulder for new or changing lesions. I won’t be surprised if (more likely when) something atypical surfaces. I would not wish my Hawaii experience on anyone, but I realize that it’s a fairly common story for a lot of us. It’s much easier to neglect our skin than to protect it, and sun-related myths and naiveté are still pervasive. Some statistics out of the UK bear this out, and are really alarming: a quarter of those who work outdoors with children admit to a child having sunburn while in their care. In addition, 40% of children still turn up to outdoor sessions without any sun protection whatsoever. Over 60% of those surveyed also admitted to hearing young children discussing “getting a tan.” In North America and the U.K., the rates of melanoma have risen faster than any of the 10 most common cancers over the last 40 years – increasing more than five-fold since the mid-1970s. I’ve been living in southern California for over a decade and have learned, admittedly too slowly, to be even more vigilant about sun protection in this climate. I worry about my son spending so much time outdoors. Because even if he’s protected from acutely burning, the cumulative, daily exposure can, and will, result in damage to his skin’s DNA. The challenge is making protection second nature. The American Academy of Dermatology created universal precautions for a reason – we all should take the same precautions each and every time we go outside, whether we are in LA or Seattle. Parents often ask me how they can lessen the blow. In a prior post, I touched on general sun precautions and tips when outdoors for recreation – at recess, at the park, and at the beach. But we must also take precautions during outdoor sports and exercise. Because I grew up with the sport and never wore sunscreen, I immediately think of soccer (or football for more educated readers – Come On, Chelsea!) as an example. When playing sports, like soccer, kids tend to wear fewer clothes, no sunglasses, and no hats. I don’t know what sport, if any, Liam will choose, but he won’t be getting on the pitch without sunscreen. Re-application is particularly important as we perspire, which causes sunscreen to lose its efficacy at a faster rate. When walking, running, biking, and hiking, both Liam and I wear hats, shades, and sun protective, tightly woven, and breathable clothing (the darker and tighter woven the fabric, the less UV penetrates). 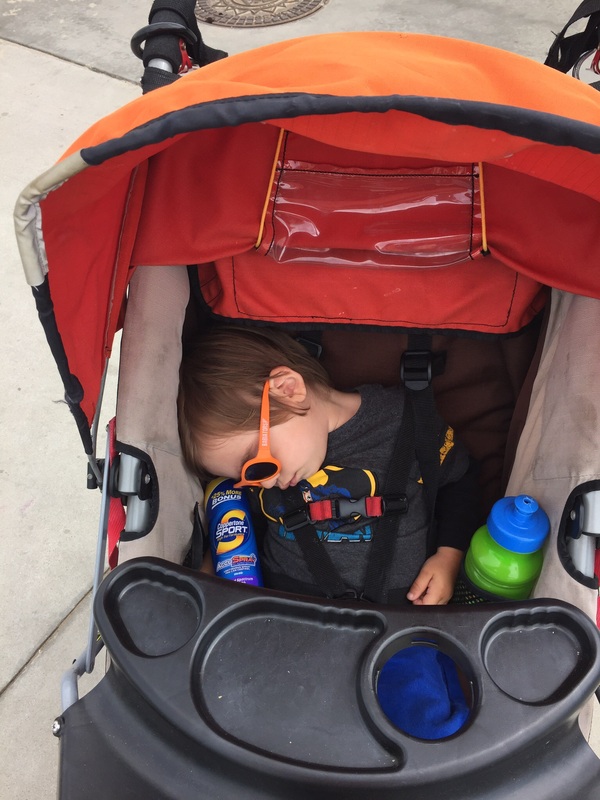 We have sunscreen in the diaper bag, stroller, in my purse…you get the idea. While storing sunscreen in a hot car is not ideal, it’s better than forgetting it. Making sun protection a habit is also key: research by Dr. Benjamin Gardner, a senior lecturer in psychology and habit formation expert in the U.K., found that “after just two weeks, an easy to follow sun protection routine is likely to become second nature, helping those who work with kids to think automatically about protecting the children in their care.” I’m used to the three-week rule when it comes to habit formation, so I’m thrilled by the two-week notion.